If the Asus ZenWatch 3 is the last Android Wear 1-running smartwatch we review, it's a fitting finale. Put it next to the original LG G Watch or even the first Moto 360 and you can see how far the smartwatch has come in form and function, despite Android Wear 2.0 taking its sweet time. This isn't to say the ZenWatch 3 is the best Android Wear watch you can buy right now, but it's undeniably one of the best looking. Or it will be until the Wear 2.0 levee breaks, and we get a flood of new devices. The good news is that the ZenWatch will be getting the software update very soon, so you needn't wait around if you've set your heart on Asus's third smartwatch. Sadly, we haven't been able to wait that long, so for our review we've been using Wear 1.5. We'll return to the ZenWatch 3 when it gets the flashy new makeover, but until then, what's the verdict? 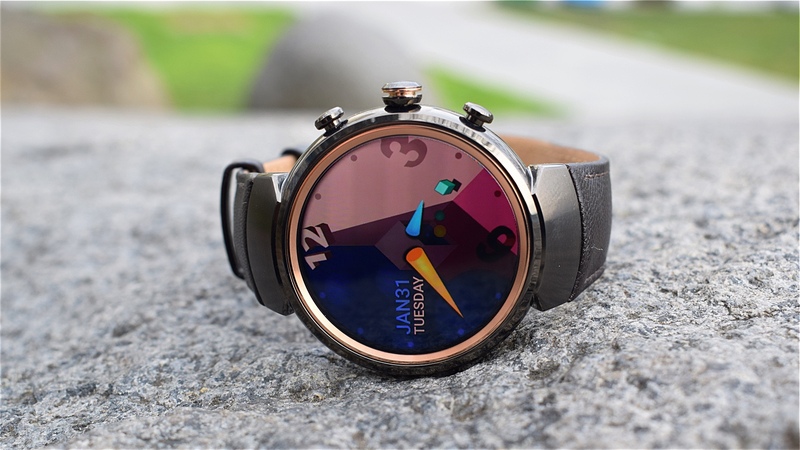 The ZenWatch 3 is a beautiful smartwatch, and the first round one from Asus; the rectangle has thankfully been retired and there's nary a flat tyre in site, meaning this is the full 360-degree experience. It really is third time a charm, and Asus has made something that couldn't be accused of being too bulky – looking at you, Samsung Gear S3 – even if it will prove a little wide for some. When we first played with the ZenWatch back at IFA 2016, we weren't massively impressed by the silver and white, but the gunmetal option with brown Italian leather strap is much more alluring. Disappointingly, the band is only interchangeable with ones tailored for the ZenWatch 3. At 45mm wide the ZenWatch 3 isn't small, but with a 9.95mm depth it's also thin enough to be considered elegant. It's just a shame that this is let down by the large metal lugs that stop the watch sitting perfectly flush against non-Asus-standard wrists – and make it impossible to lay it flat. They make the watch feel unnecessarily rigid, and those with thin wrists should be wary of this. The 400 x 400 resolution AMOLED display is pleasingly vibrant, and down the right side of the case are three chronograph buttons, the middle of which, despite actually rotating when you move it, doesn't work as a scrolling crown as on the Apple Watch. Still, it adds to the ZenWatch 3's feel of an authentic timepiece. The top button is set to Asus's ZenFit app as default, and the bottom is Eco mode (just a fancy way of saying Airplane mode, really) but both can be changed to a different app if you'd prefer. The Zenwatch 3 comes running Android Wear with a few Asus twists that give it more of its own identity – more on that in a bit – though it lacks some other more notable features. For starters, no NFC, so even when it does get Wear 2.0 the ZenWatch won't be supporting Android Pay. There's also no heart rate monitor, nor is there GPS. With the ZenWatch 3 pitched more at those who want a classy looking smartwatch and not a fitness device, this isn't a huge stick to beat it with, but it also means the fitness features that are there become quite a bit less useful. Out of the box you'll have Asus's ZenFit app running on the watch, which sits in the background tracking your movement throughout the day. I've found the step counting to be quite accurate, but you can also start a recorded run, walk, sit-up session or push-up session from the wrist. Without GPS, distance is measured by movement sensors, so it's not the most reliable way to track your travel. I did find the sit-up and push-up tracking to be accurate, save for a couple of times when it was off by one or two, but then I'm not sure who would need an app to count either of those things. If you do happen to take it running (and please, swap out the leather for a sports band before you do) the standard 4GB of onboard storage will let you load up your tunes and pair some Bluetooth headphones. Don't get it too wet, though, as the IP67 rating means it will survive rain but not a more serious dousing. Again, if you're looking for a fitness watch, look elsewhere. There are other Asus apps in the mix too, including Asus Weather, Remote Link and even a flashlight app, which can be installed through the Manager app. Powering all this along is the Qualcomm Snapdragon Wear 2100 chip, which, surprisingly, hasn't kept the experience as smooth as I'd hoped it would. It's far from the most sluggish Android Wear experience I've had, but it does chug a bit when notifications start piling up. True, this is partly a problem with Android Wear, and version 2.0 promises to make dealing with notifications less laborious, but I've also noticed some jittering when moving around menus. Nothing dramatic, but still noticeable from time to time. I want to talk a bit about the special touches Asus has brought to Android Wear in the ZenWatch 3, as the lack of flexibility in letting OEMs tamper with Wear has been a criticism levelled at Google. Now, Asus still hasn't been able to run wild, but it has added some of its own ingredients to the Android Wear experience that let it carve out more of an identity, including the apps we mentioned above. The UI has also been tweaked, with gold colouring that matches the gunmetal design plus some different shades to the backgrounds. As mentioned before, the three buttons are also customisable, and you can head into the button setting app on the watch to play with them. Asus is also offering up a huge range of its own watch faces to choose from, but to get to these you'll need to download the separate ZenWatch Manager app from the Play Store. This isn't a compulsory download, though, and you can still use the ZenWatch 3 with just the standard Android Wear app if you prefer. How in the name of Cher's Next Album Cover did this end up in the 'Most popular' section? I want names. But there are plenty of less offensive options, and you can tweak things like hand motion (smooth or ticking) and screen dim timeout in the app too. If you're still left wanting after browsing Asus's extensive gallery, you also have the option to create your own using the FaceDesigner app. Battery life on the ZenWatch 3 isn't bad by smartwatch standards. I've managed to squeeze a little over two days on average, but that's with moderate, mostly passive use; mainly just checking notifications from time to time. With more intense app use you're going to burn more hours off, especially if you keep the screen in always-on mode. On the plus side, the round charger juices up the watch nice and quickly: 30-45 minutes and you'll be fully powered up again and ready to take on the world. The Asus ZenWatch 3 is a well-rounded smartwatch, but Asus's fitness angle is weak without the features to support it. This is all about style, and it will be a much better device the moment it gets Android Wear 2.0. Until then, you're still looking at a classy watch with decent battery life and some nice custom twists from Asus.